Further to my last, here is a folder that has the extracted files and folder system. I also have W4FOK's MILL Program there. How Much Did it Cost to Send a Telegram ? Journal of the Telegraph, Jan 1, 1877, vol. 7, p. 168, states that WU's "average toll" on a message in 1868 was $1.10, and in 1874 the "average toll" was $0.55. So sending public telegrams was not a nickel-and-dime novelty ! so it's gotten more expensive in recent years. You would think it would be cheaper but it's not. Demand is low, but perhaps supply is even lower, which is why it's expensive. Why do similar sounder sound so different(ly) ? Take two otherwise identical sounders. Same maker, same coil values, same construction, same adjustment, same operating current, and resting on the same surface. One produces an absolutely dreadful dead, clunky tone, the other produces sharp, crisp dotting. Worked at speed, the one produces a roar which overpowers the distinctness of the lever strikings, the other yields a delightful stream of easily distinguishable staccato reports. Whether in "as found" condition, or rebuilt. Is it the wood used for the bases (hard vis-a-vis soft,) or is it the metallurgy of the brass? More importantly, how does one change the sound quality of a dead, clunky sounder, and make it bright, crisp and alive? I should add that I have performed the "fishing line test" on these sounders with disparate tone, suspending them in mid-air with fishing line, so that the tone they produce is not modified by the surface on which they rest. The clunky ones still sound clunky, and the crisp ones still sound crisp. One more thing to add... I work my favorite sounders in resonators. Under each sounder I insert two strips of styrofoam, about 1" thick, and make sure that no part of the sounder or its base contacts the resonator structure. This insulates the resonators from transfer of mechanical energy given off by the sounders. By this ploy, the distinctness of the clicks is preserved and is not transferred to the wood of the resonator, where it tends to become a roar of "woody thunk." I suspect it's a combination of factors. Certainly, brass may have different densities and other metallurgical characteristics that arise during the manufacturing process. Even if wood is of the same type, it's density varies due to densities in lumber as it is processed in the mill. Another factor is likely the resonator or platform on which the entire sounder assembly sits. As an exercise, take a standard main line sounder and move it to different tables and surfaces. As the sound is conducted into different surroundings, it may range from sharp to a dull thud. A sounder creates a surprising amount of vibration. I suppose it's not unlike the behavior of musical instruments. Identical guitars or violins have different characteristics, even when played expertly by the same person. Performance spaces change the sound as well. I usually like a direct mechanical connection between the resonator and the sounder as well. It tends to soften the report somewhat. My favorite combination is the WE 3C aluminum lever sounder in a resonator. It's a nice balance between a clean report and sufficient resonance to make it pleasant to listen to. Yes, I find that with the sounder attached firmly to the resonator, it improves the "fullness" and "penetration" of the sound. I can feel the vibrations by just touching the resonator surface both with a classic resonator type and with the two WU press units I have, the over and under and the side by side. Im working on some vintage 1930's QSL designs I may offer online on a limited basis. I also enjoy vintage QSL cards, especially cartoons, and more especially Phil Gildersleeve. An image database of SKCC member QSL cards has been set up. Feel free to add your own cards, present & past. Directions are on the db page. The art of lacing is still used in the aviation industry. Here is a you tube video. I I did this already in 1964 at a provincial electricity company. In my PLL Nr. 1 of 30-01-08 was the following URL. There are approx 40 entries in the list but only two sideswiper keys. (You can sort the list by clicking on the column titles.) Include a photo and/or youtube video link also if you like plus your comments about the key. Homebrew keys are certainly welcome as well. The October 31 edition of Space Weather, from Tamitha Skov. Remembering the Seventies where I had the chance to observe our Iono in real time is just the same as watching the interlacing various clouds in the sky... where you can observe the various F layers moving and changing every seconds is just amazing ! A good friend of mine (G3SCB), who used to be employed making ionospheric predictions for the British government, recently made the comment to me that the current state of ionospheric knowledge is a little like weather predictions were in the 1950s. We still have relatively few ionospheric sensors. This image, from a recent issue of Geophysical Research Letters, gives the first (and only) direct wide-angle snapshot of ionospheric ducts. The straight lines are geomagnetic field lines. 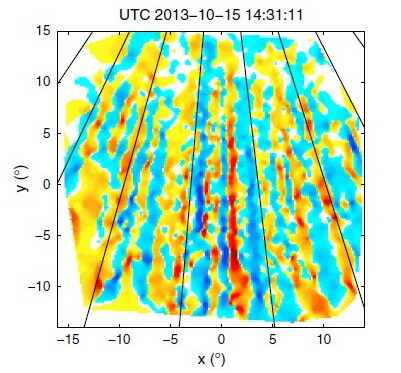 The observations were taken with the Murchison Widefield Array in Western Australia, operating in this case at 183 MHz. It is a snapshot of the ionosphere above the radio telescope at that time. With the ionospheric structure being this complicated, changing all the time, and given how few ionospheric sensors there are around the globe, I think it's amazing that ionospheric predictions are as good as they are. I prefer to use real time propagation measurements, such as are given by WSPR reports or the Reverse Beacon Network (RBN). Australia is much better, and Europe is excellent. 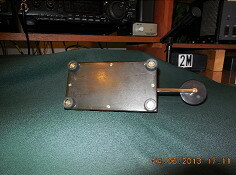 Jean, how about setting up a WSPR station, either just transmitting, just receiving, or better still both? While taking care of the Belgian Foreign Affairs Radio Network from my Base in Washington DC I came across with a company called Barry Research, Sunnyvale,Ca showing equipment at the AFCEA show at the Sheraton Hotel in 1972. A few years later the company changed name for B.R. Communications led by Dr Fenwick an Larry Peden, both ex assistants from Stanford University. 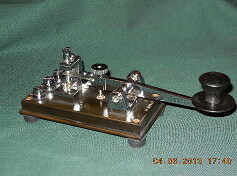 The HF Oblique Chirpsounder for the Ionosphere observation in real time. The idea behind this was to provide Real Time HF Links mainly for the military, various other services and Universities for further research. Then the unexpected Falkland War erupted, the British invaed Sunnyvale and bought everything we had on shelves, so the mass production started from there, the Chirp Sounder was something anonymous and we started offensives to have it approved by the Military and the ITU. The US Military decided otherwise by accepting our product under AN-TRQ-35V from there all British Forces have been equipped, followed by all US forces including AWACS, Saudi Arabia in full, Australia, South Africa, Greece, Jordan, for their Universities, Belgium for Foreign Affairs, no accepted in Germany because of the chirpy sweep 2 to 30 Mhz, I made 5 presentations in Egypt too, it was a fantastic tool to determine circuit faisability and its reliability. On a quiet Qrg you can still hear the chirp passing by as many users are still having their Chirp system working around the world, probably less and less but I can hear some every day. http://www.dod.gov/pubs/foi/Reading_Room/DARPA/301.pdf Sounder cited but could not find it ! Many thanks for the fascinating background. The links you gave are fascinating too. 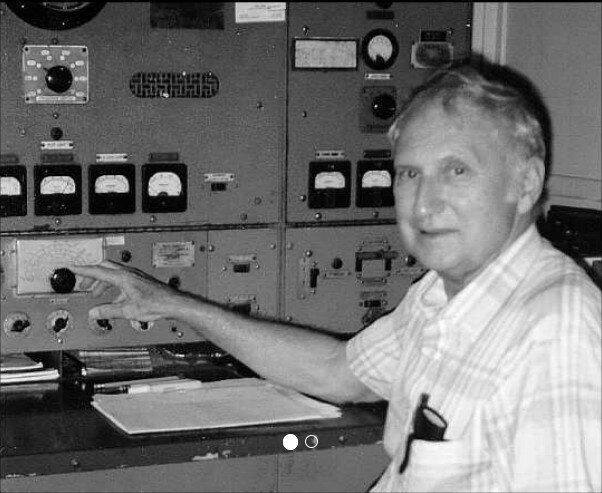 Several years ago, probably in the mid or late 1970s, there was an article in Radcom from the RSGB about receiving and using several chirp sounders that could be heard in various amateur bands. The chirp radars were easy to detect, but I never set myself up to decode the sweeps - which as you say, involves very precise timing - although I always wanted to do so. 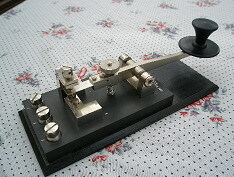 Another spin-off was an oblique chirpsounder now in use in the ANffRQ-35 frequency selection system for high-frequency military radio communications. 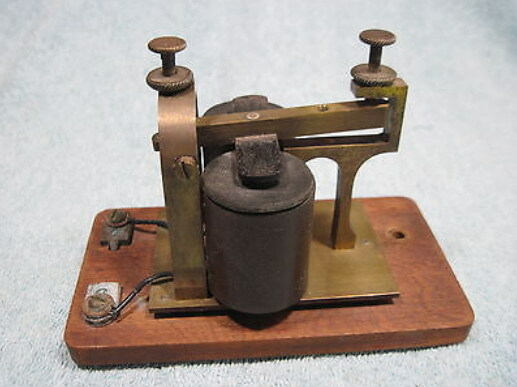 Another early result from this same group was the Barry high-frequency sounder, using a low power, continuous-wave, digitally controlled, highly linear frequency-swept signal, (FM-CW). A significant achievement of this digital sweep, due to G. Barry, was that it preserved phase coherence. ll This technique and the associated digital-processor and receiver equipment was used to obtain high range resolution and select favorable frequencies for OTH radar. Earlier Navy poor experience with a major investment in other HF sounders led to rejection of the Barry Sounder for nearly 10 years. There are other instances quoted in the document. Cheers, Darrel, aa7fv & g3sys. Does the design affect dit length? Shorter dits are best so which one of these does best? Wow, where does this come from? Who says shorter dits are better, does it really matter anyway and why? If we are talking about sideswipers, and as we are are on the SSN reflector I imagine we are, in my personal opinion I regard sideswipers as being a means of sending your own personal interpretation of the code and as that involves differing dah lengths then dit length should also be of indeterrninate length to suit your own particular style. However, I think you are thinking about dit length in respect to the design of the key which in the case of a bug could be the case, whereas with a cootie the dit length is entirely down to the operator.. I tend not to think about it really, Steve, I just get on and do it, it quickly becomes obvious if folks don’t like my style of sending 'cootie style' by their responses and I have even had some hard criticism on air once or twice. All in the game!! I think that all designs do the same dit length. I didn't intend to insult folks here. Many Cooties lack sufficient gap between dits and much has been said about how to prevent this. One common method is to use a rather wide gap between the contacts or keep the finger and thumb some distance away from the paddle. Doing this increases travel time and increases the time between dits thus reducing the characteristic "slur" some have. My question involves the mechanical construction of the key and whether any particular design is more favorable for increasing the dit gap and coming closer to the ideal 1:3 ratio. Yes certain you can wax elephants all day about personal touch and your right to individual taste etc. etc. I just asked a simple question here. It's more about physics than anything and yes "it's down to the operator" to a degree however let's look at the mechanics as a way to improve our sending. 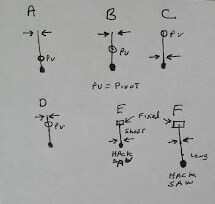 As the dits that follow each other ( H, 5, S) are made simultaneously on the left and right side, the position of the lever relative to the contacts does not matter. What is important is the distance between the contatcts. The closer they are, the shorter the dits will be. For example if you want to send 5 in B design, the first dit will be shorter than the following four. For the dashs, you have to slow down the wrist movement, and try to find the exact speed giving the ratio you like to hear. Med: Don't you mean the closer the contacts are, the longer the dits will be? At least that's what I experience. The reason is because the gap between dits is shorter due to the short travel time. What I would like to discover is a mechanical way to force a long time gap between dits without having to increase the swing to a large degree. A cootie key is much more complicated than it looks. Good sending depends on spacing and tension on the lever and the bending of the lever (if it's flexible). If you have too close spacing, you are apt to slur the dots. Adjust the key for clear well proportioned code elements. Otherwise good enjoyment on your enterprise. I was hoping to hear some terms like inertia. Inertia acts to keep an object in motion or prevent it from starting. Would it seem prudent to have the lightest weight lever possible? Would aluminum vs. brass make a difference? I have a cootie with springs that begin very easily but toward the end they are very stiff and tend to garble my sending. N1EA mentioned "bending" ... Now that's an interesting one. With a solid lever the cootie is like a hammer. The hacksaw blade has a soft touch. Bending might help keep the contacts clean as there would be a wiping motion similar to that of a relay contact. I believe that just as different operators can generate different QSDs using the same Straight Key without the need for any adjustment changes. I think in relation to sideswiper we have the same situation. What defines the final QSD first is the operator technique, the characteristics of the key are in the background in order of importance. On sideswiper has no way to blame the key for a bad QSD, all the quality depends on the control and skill of the operator, it's like a cursive handwriting. Obviously skill and technique matter but some key designs will take more skill than others. For example, if we make the lever weight 10 pounds it will slow us down. If we make the finger piece too thick or the height thereof too high our sending will suffer. I'm looking for objective things we can do, not just elusive imaginations about skill. Look at the many designs attempted on the bug like how Bunnell's Gold Bug was such a flop along with the Vibroplex Model X. Why? Some things work better than others regardless of operator skill. all cw keys, many give up because of the difficulty presented. The sideswiper itself is an essential key, very simple and elemental in its construction and "anatomy", in use it gives the operator viceral feedback, it becomes an extension of who you are. J Mot Behav. 1981 Mar;13(1):1-8. Technical considerations regarding the short (dit)-long (dah) key press paradigm. The finding of longer reaction time prior to longer-lasting responses (e.g., Klapp, 1977a; Klapp, Wyatt. & Lingo, 1974) was not replicated by Kerr (1979) in a statistically powerful attempt. The present experiment confirms that this effect is not reliable when duration knowledge of results is similar to that used by Kerr, although a reliable long-short effect was obtained with other knowledge of results arrangements. This unexpected sensitivity to knowledge of results suggest that previous results from this paradigm must be interpreted with caution. Just kidding.....I have no idea what the above means. I appears to me that design "D" would have the most tension on the lever so would demand smaller contact gaps and thus create "shorter" dits which would allow higher speeds? Wouldn't the speed of the dit depend on how fast you actuate the lever. As speed increases, dits get shorter. I don't think the mechanism has anything to do with dit length. I prefer somewhat larger gaps for my keys than I would usually set up with the key in paddle mode. It forces me to slow down a bit and pay attention to my character and word spacing. When the op on the other end tells me that he thought I was using a paddle instead of a swiper, that's when I know I'm doing good. Of course I've been scolded as well for even using a swiper! Anyway, for me it's about building a great key that's fun to use and easy on the eye. I've been using swipers almost exclusively for over 5 years now and using anything else seems weird to me, but I do enjoy the occasional sk, bug and paddle adventure! Control and Timing is the key. Don't try to stop the movement when making a Dit or a Dah.....practice your timing and your follow through.....the SLOWER you are able to send accurately the more control you develop for any speed. Much easier to send fast but control is key imho..
Wow, I agree with Nathan. I have a home brew made with a hack saw blade that is very light and a Begali Sculpture Swing that is quite a bit more stiff. I can switch keys in the middle of a QSO and you can't tell the difference. There may be some effect for sure on how the key responds but how the spacing works is mostly the operator. Further to the discussion on weight of movement. 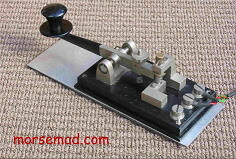 I have a home brew hack saw blade key which is very light to use and a Begali HST which is a more positive feel. The home brew is much more flexible and will twang effectively at the end of a QSO. Cootie Wacker? Give the ham a bone, and QSD goes rolling home. At the end of the day, or ultimately, a dot is a dot until it becomes a dash , problem solved ! Thanks for starting this interesting thread Steve. I agree with our SSN expert panel, good stuff. As Pete says, "Control and Timing is the key." - A "sprung contacts" (tiny flexible strips of brass or steel); this provides a cushioning effect that tends to produce "longer" code elements. The action is very smooth and quiet. Not recommended for fast sending, > 30 WPM. - A contact directly mounted on the lever; the sending is much more responsive but the action is noisier, clickety-claks. Good luck and happy swiping Steve! Which sideswiper do you like the best? or perhaps Alberto I1QOD's copies? Allen, very grateful for the comment, I'm new to sideswiper but I'm excited, hi. I think the Rugby version of the PS-213 key is a later version around 1983. The version called the Portishead version took the old key - many had failed over the years because the long contact tongue with the silver contact eventually broke. They turned around the little platform in the back and then shortened the tongue. On the Portishead keys, the rear contact platform looks like a C but it is facing away from the operator. The original PS213's had the C shaped contact platform facing the operator. See the original PS213 in the first two photos, and the reproduction PS213 by Phil G0NVT below it. Contrast this with the Rugby Portishead version below these. Phil G0NVT refurbished this original PS213. Note the long steel tongue at the rear contact. G0NVT tried his hand at a copy of the PS213 and made a custom modification to the key - one that it really needed - a base to prevent it from tipping when being used. Back around 1983 Portishead Radio at their Rugby shop refurbished some of the old PS213 keys in use. Notice the very short contact tongue and the contact platform C shape facing the rear of the key. The Rugby shop moved the base around so that it fit the shortened contact tongue making the key "stiffer" when sending and they also put a needed base on the key so it would not tip over when in use.